I was wondering around the garden this morning, camera in hand, hoping to find some raindrops after an early morning shower. 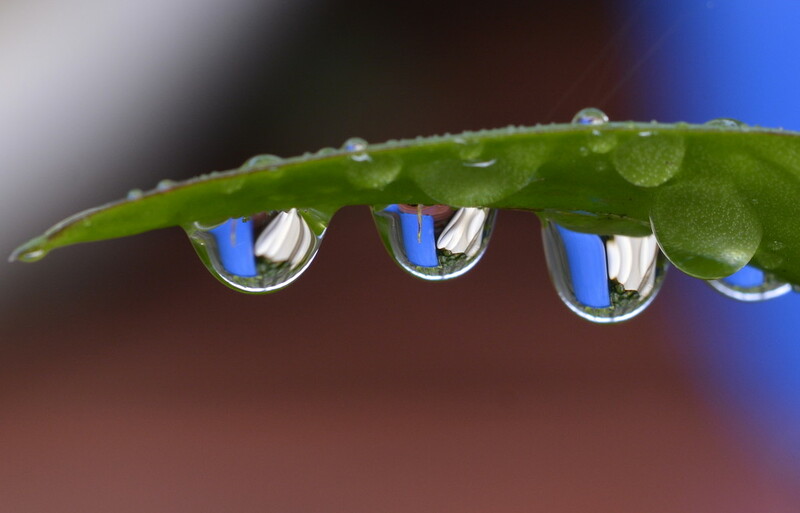 I thought that the refracted image of the blue and cream pots in these drops was beautiful. So lovely. As if the world is hanging upside down. @maree_sanderson I'm having trouble accessing the the discussion board on my computer, I can see people's replies, but not the challenge info, so I'm not sure what is involved. Oh, yes, the reflections in the drops are very pretty! Well seen and beautifully captured! I love garden walks after showers when all is so fresh. I took one this morning, too! Love the Blue in the reflection. @sailingmusic @sarasotab @mittens Thank you, the blue showed up beautifully in the drops. @janetb Thanks Janet,I head out into the garden after the sprinklers have been on too. @maree_sanderson @merrelyn This is beautiful - yes just tag it macros-waterdrops and it will appear as an entry for the current macro challenge. Love this macro image, Merrelyn! Fabulous! Fav! Excellent composition, sharpness and reflections in the water drops! FAV! These are gorgeous raindrops with such wonderful reflections ...Awesome pic! Perfectly captured, just stunning! Fav. Amazing capture great vibrant colours Fav. Late on the comments but this remains a fabulous capture! fav! @mittens @deborah63 Thank you so much for letting me know. What an unexpected thrill.